Roasted turkey, smoked gouda, homemade chipotle aioli, organic greens, onion relish. Toasted sourdough bread. Honey ham, dijon mustard, caramelized pineapple spread, cracked-pepper goat cheese, organic greens. Toasted olive bread. Turkey, bacon, avocado, local hard boiled egg, tomato, organic romaine, blue cheese spread. Toasted sourdough. Organic romaine, artisan parmesan cheese crisp, homemade caesar dressing, pulled chicken breast. Toasted sourdough. Wild pole-caught albacore (American Tuna(tm)), Kalamata olives, capers, organic celery, onions, swiss cheese. Toasted olive bread. Goat cheese, avocado, pickled shallots, tomatoes, organic grilled squash, organic cucumbers. Toasted multi-grain. Roasted chicken, house-made pesto, fresh mozzarella, house-made sun-dried tomato spread, roasted garlic spread. French artisan roll. Organic grilled squash, bell peppers, grilled onions, roasted mushrooms, brie cheese. French artisan roll. Salami, Prosciutto, three cheese blend (Provolone, Swiss, Cheddar), grain mustard, pickles shallots. French artisan roll. Brûlèed ham, cream cheese, house-made curry-apple chutney, sharp white cheddar, organic greens. French artisan roll. Brie, sharp cheddar, provolone, swiss, grilled onions, organic sautèed spinach, fresh jalapeño & sliced tomato. Toasted sourdough bread. House-braised pork shoulder, smoky-sweet barbecue sauce, house pickles, creamy slaw. Toasted sourdough bread. 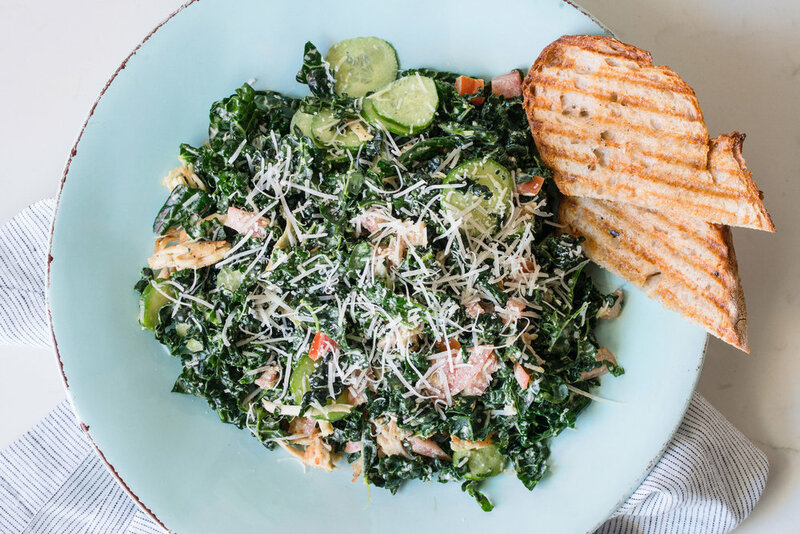 Organic kale, roasted chicken, organic cucumber, tomatoes, artisan parmesan cheese & home-made caesar dressing. Organic spinach, Kalamata olives, organic carrots, balsamic vinaigrette. Sustainably caught albacore with organic quinoa & soft boiled egg. Organic cabbage, organic spinach, organic carrots with local organic tofu, shiitake mushrooms, sesame seeds & miso ginger vinaigrette. Organic romaine tossed with salami, domestic prosciutto, red olives, Kalamata olives, feta cheese & house-made balsamic dressing. Organic spring mix, organic black beans, roasted bell peppers, charred corn, organic grilled onions & Oaxaca cheese with creamy balsamic dressing.